Just got braces? Know somebody who has? 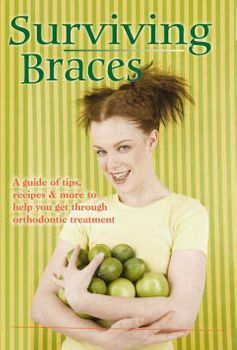 This book is an invaluable guide, chock full of answers and advice on how to survive braces on your teeth! Co-written by an orthodontic technician with 32 years of experience, and edited by an Orthodontist, Surviving Braces packs a lot of practical advice into its 160 pages. Included are chapters detailing what to expect when you get braces, dealing with orthodontic emergencies, braces trivia, space for an orthodontic diary, more than 65 delicious recipes, and a ton of practical tips and facts. There is even a diagram showing the parts of braces, to help you better understand what your orthodontist is talking about! This is a great book for kids and adults alike, and would make a much-appreciated gift anytime. Surviving Braces is 160 pages, and includes chapters detailing what to expect when you get braces, dealing with orthodontic emergencies, braces trivia, space for an orthodontic diary, more than 65 delicious recipes, and a ton of practical tips and facts. This is a really nice all-in-one book for anyone new to braces. There is plenty of advice and a bunch of really great recipes. It makes a really nice gift.